Making a difference is easier than you think! Make the Earth and yourself happier by having healthier nails than ever! Trade in your old polish (any brand, used or unused) for brand new bottles of ZOYA! Zoya, the exclusive pioneer of the healthier, 10-Free & breathable natural nail formula invites you to trade in your old, not so healthy and unwanted nail polishes for brand new Zoya bottles. We'll even dispose of your old bottles in an environmentally friendly way. As the trusted brand among professionals and women who want cutting edge color with the safest formula available, we thought it only makes sense that we take the lead! Have old, unused nail polish taking up inventory space? 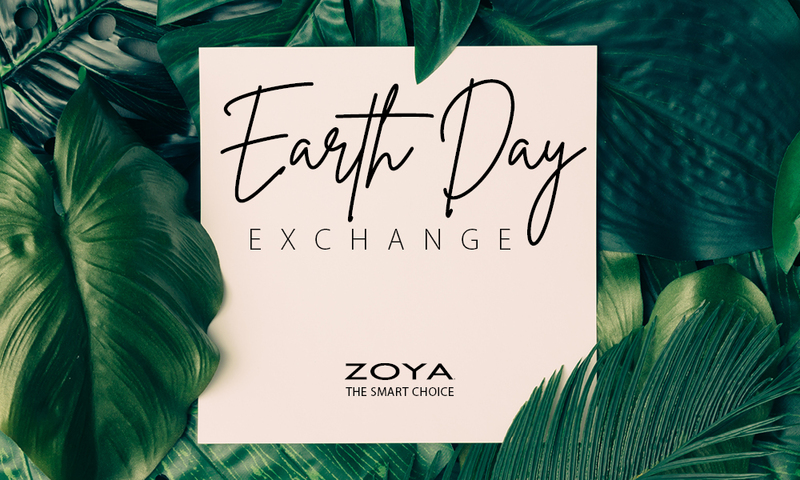 The Zoya Earth Day Exchange is the perfect way to stock up on fresh and healthy Zoya. Will you join us and make the switch? After all, #HealthierIsHappier! online or if you need help with your login credentials, please call your Salon Coordinator to assist in getting you set up. from your order of 48 or more Zoya Nail Polishes. Salon Professionals. Your form and order must be submitted by 2PM EST on 4/29/2019. your Salon Coordinator. No credit will be given for polishes sent back without a Return Authorization number. We will issue return instructions once we complete your order. Offer valid online at www.zoya.com only 4/2/19 - 4/30/19 (ends 4/29 for Salons). Continental US & Canada ONLY. International shipping fee applies. Not valid with any other codes, coupons or promotions. Consumer accounts must purchase a minimum of 6 polish colors. Salon accounts must exchange a minimum of 24 polish colors and purchase a minimum of 48 polish colors. Polish can be from any brand and can be exchanged for open stock (individual) .5oz Zoya Nail Polish shades only. Offer includes the Z-Wide Brush for .50 cents each when code is applied. Excludes sampler packs, gift sets, Mini Sizes, Zoya Treatments and Naked Manicure Treatment Products. Earth Day Promotion only valid for any Zoya colors available at time of first day of promotion (4/2/19). Offer is not contingent on consumer returning polish. Return of Polish is mandatory for Salons. One code per account. Art of Beauty is not responsible for incorrect addresses, credit card entry errors or any errors outside of our control. All Nail Polish Exchange orders for NEW Zoya Nail Polish will ship FREE via Standard Ground Shipping - shipping costs on the exchange of unwanted polish back to us is the customer's responsibility. Please allow up to 6 weeks for shipping and processing. Art of Beauty, Inc. reserves the right to remove any polish that is out of stock from your order, and you will not be charged for these items.